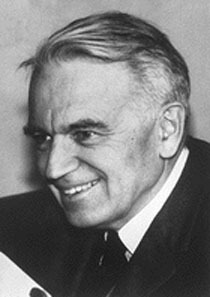 Canadian scientist Gerhard Herzberg pioneered molecular spectroscopy, the science that studies how light is emitted or absorbed by atoms and molecules. He was born and raised in Germany, but fled to escape the Nazi regime that had taken power. He was not Jewish, but his wife was a Jewish spectroscopist who had collaborated with him on his early work, and he would not risk her life. He was a vegetarian, a teetotaler, and a brilliant scientist who used atomic and molecular spectroscopy techniques, often of his own design, to elucidate the structures of structures of free radicals, other diatomic and polyatomic molecules, and astronomical objects. In 1929, Herzberg became the first scientist to accurately explain chemical bonding at the electron level. In 1941 he observed the spectra of themethylidyne ion CH+ in interstellar clouds (clouds of gas found between stars), proving that CH+ exists in space. In 1948 he proved that the hydrogen molecule exists in planetary atmospheres. In 1956 he obtained the spectra of the methyl radical CH3. In 1959 he obtained the spectra of the methylene radical CH2. Herzberg was a physicist, but his work was of great value to chemistry because it dealt with the internal geometry and energy states of molecules. In 1969 he reached the mandatory retirement age of 65 but refused to retire, and was instead given the title Distinguished Research Scientist Emeritus, and continued working full time. He won the Nobel Prize for Chemistry in 1971, mere months after his wife's death. In 1974 he became the Director of a new facility named in his honor, the Herzberg Institute of Astrophysics in Ottawa, where he worked until his health began failing in 1995. He died in 1999. He is the namesake of the Natural Sciences and Engineering Research Council's Gerhard Herzberg Canada Gold Medal for Science and Engineering.